On Saturday, January 19, the Pikes Peak Pen Women visited Special Collections to learn about historical writers and artists in Colorado. They viewed the original handwritten manuscript of Helen Hunt Jackson’s novel Ramona, books by Ann Zwinger, artists’ books by Alicia Bailey and others, and postcard collages by Mary Chenoweth. Special Collections is home to the papers of Chenoweth, an artist who taught at Colorado College from 1953 until 1983. She made sculptures, woodcarvings, woodcuts, watercolor and oil paintings, etchings, and more. 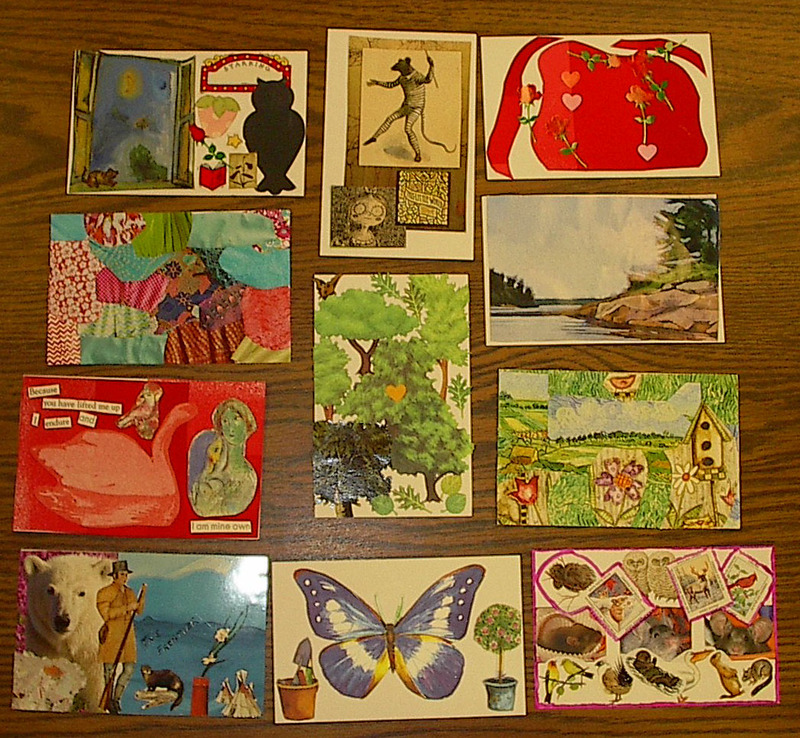 Making art was an everyday activity for her, and she frequently created one-of-a-kind postcard collages and mailed them to friends and family. The Pen Women usually do some kind of writing exercise at their meetings. This time, instead, they made their own postcard collages, using recycled materials such as scraps from magazines and catalogs. I hope the club members will do as Chenoweth did and mail their postcards to friends and loved ones. Perhaps we can start a home-made-postcard-making trend! This entry was posted in Uncategorized on January 21, 2013 by jessyrandall.